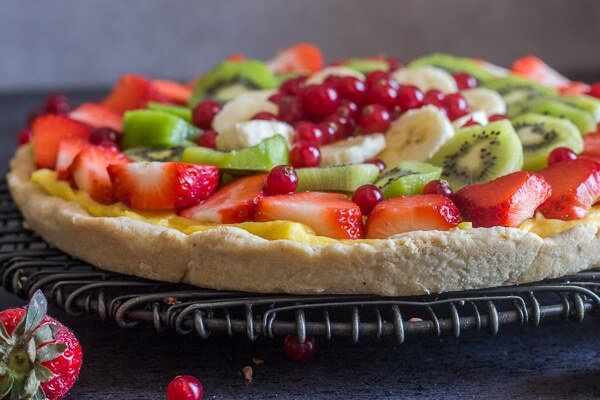 A delicious Fruit Pizza made from scratch with a flaky pie crust base, an easy Italian pastry cream and topped with mounds of fresh fruit! The perfect dessert. I am always looking for different ways to use my Creamy Italian Pastry Cream. 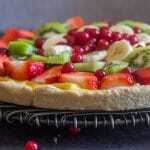 With the availability of fresh berries during the summer I knew a Homemade Fruit Pizza would be perfect. 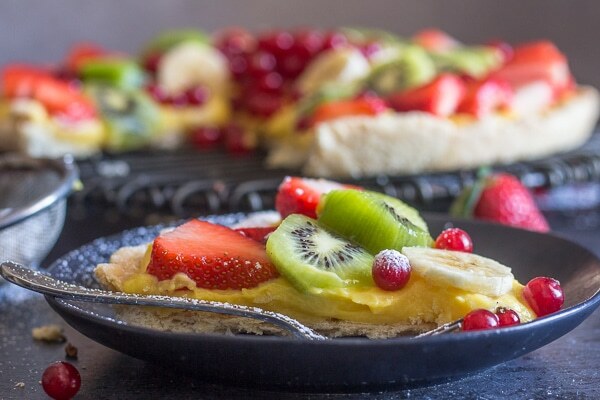 I decided I wanted to combine my Mom’s flaky pie crust (although if you want you could make it with my (Italian Crostata Dough) and, a creamy Italian Pastry cream with all those delicious sweet berries and fruit that yell Summer! The first thing I did was make the Pastry Cream since it needs to be refrigerated for a few hours. Then I made the pie dough and blind baked it. I love these kinds of desserts because you can basically make everything in advance (the day before) and put it together just before serving, which is exactly what I did. 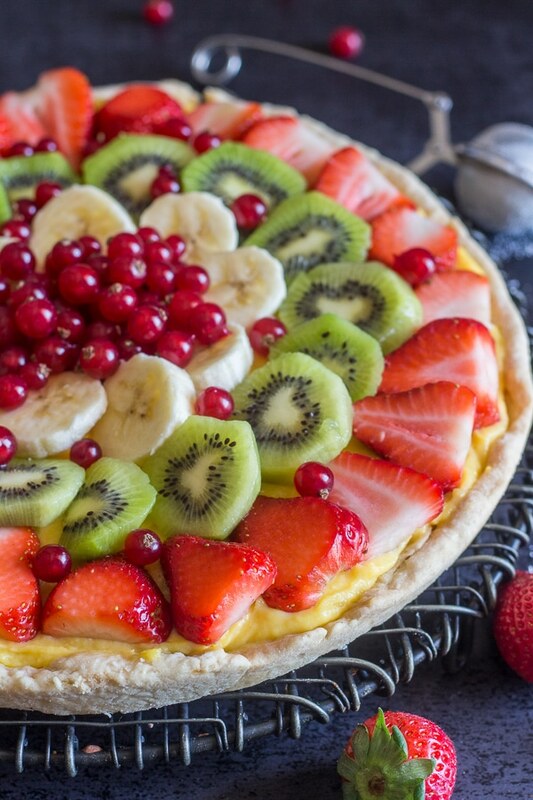 Just top the baked crust with the pastry cream then add the sliced fruit on top, dust with some powdered sugar and serve. trim the edges, and prick the bottom of the pie, then line the crust with parchment paper. Add pie weights, such as dry rice, dried beans or like I do sugar (which you can use over many times and also use for baking so they say). Chill the crust for 30 minutes; this will solidify the fat, which helps prevent shrinkage. Bake in a preheated 350°F oven for 20 minutes. Remove the pie from the oven, and lift out the paper and weights. Return the crust to the oven and bake for an additional 15 to 20 minutes, until the crust is baked all over. 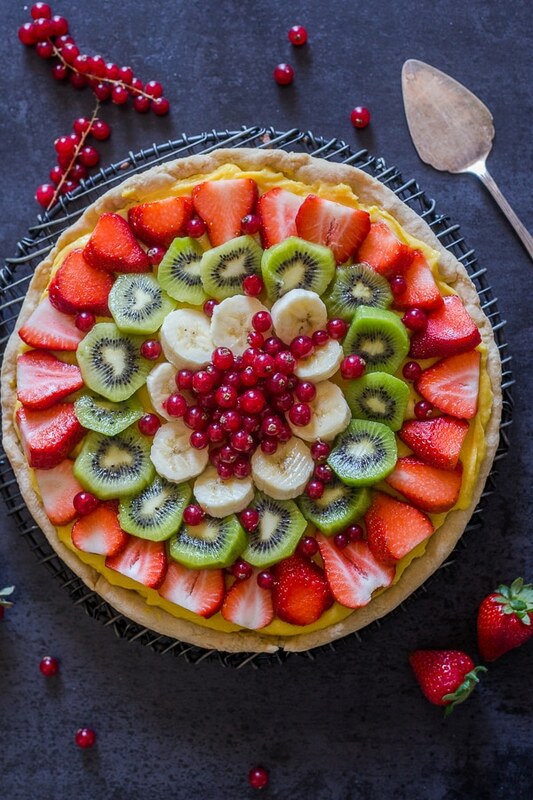 Whatever fruit or berries you choose to use, I hope you enjoy this Homemade Fruit Pizza Recipe as much as we did! **Recipe makes enough for a 2 pie crust, so the extra dough can also be frozen for up to 3 months or refrigerated up to 3 days. In a medium pot, heat over low the milk and cream, do not boil. Remove from heat and let cool to warm. In a medium pot add yolks and sugar, whisk together until combined, then add flour and vanilla, place pot over low heat, add warm milk/cream, whisking continuously until thickened. Remove to a glass bowl, cover with plastic wrap (make sure wrap touches the cream mixture) and refrigerate at least 3 hours or even overnight. Sift flour, salt and sugar into a large bowl, add butter and cut into the flour (using a pastry blender or even your clean fingers) until mixture resembles coarse crumbs (the size of peas). Sprinkle with the water (one tablespoon at a time) just until dough starts to come together. Then move to a lightly floured flat surface and knead lightly into a round ball. Wrap dough in plastic and refrigerate for at least 30 minutes before using. Pre-heat oven to 350° grease and flour an 8 - 10 inch pie plate or pizza pan. Remove from fridge (divide the dough in half, the unused dough may be frozen for future use) and place on a lightly floured surface, gently knead the dough a couple of times to soften it up. Roll out to 1/8" thickness (or a little thicker). 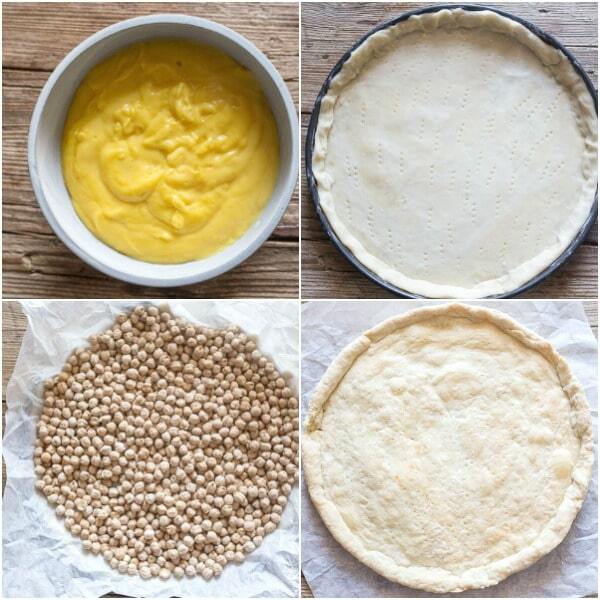 Transfer to prepared pie plate, trim the dough of any extra dough then prick the dough all over. Place a piece of parchment paper on top of the dough and fill it with dried beans, rice or even sugar. Bake for 20 minutes, then remove the paper and weights and bake for another 10-15 minutes or until done. Let cool completely before filling. 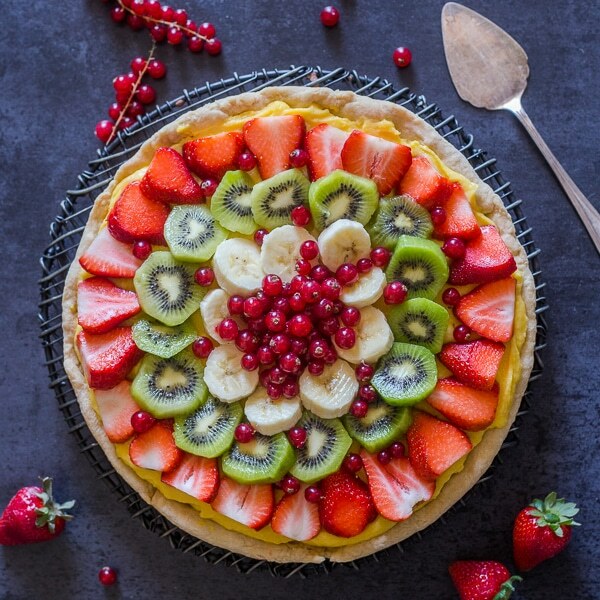 Once the chilling time has passed, spoon the pastry cream onto the cooled pie crust, spread evenly, then top with sliced fruit and berries of choice. Dust with a little powdered sugar and serve. Enjoy! Sounds delicious. Definitely going to make. I just love Italian pastry cream. Hi Ann, thanks I hope you enjoy it.